The Super Bowl is coming and this round-up of The BEST Instant Pot Game Day Food will help you make Super Bowl Party eats that will wow your guests! And using the Instant Pot will make it easy. Click to PIN The BEST Instant Pot Game Day Food! Click here to see The BEST Slow Cooker Game Day Recipes! Every year when my family has our annual Super Bowl Party, I feel like I should wear a sign that says, “I’m just here for the food!” But even for people who really care about the game, food is a huge part of Super Bowl Sunday, right? This site already has a good collection of Slow Cooker Game Day Recipes, but we know on a busy day like Super Bowl Sunday, a lot of you are going to want to use the Instant Pot. So we looked on blogs around the web to come up with this collection of The BEST Instant Pot Game Day Food! This collection will give you lots of options for game day dips, meatballs, chili, wings, drumsticks, ribs, sliders, and more! All photos are copyrighted to the blogger who posted the recipe. Just click the recipe title under any photo to see the complete recipe on the original blog. And enjoy! Instant Pot Low-Carb Ground Beef Olive Lover’s Chili from Kalyns Kitchen is easy to make and perfect for anyone that loves olives. Instant Pot Buffalo Chicken Sliders from Adventures of a Nurse starts with tender shredded chicken with a bleu cheese hot sauce that is a perfect combination of sweet and spicy. Instant Pot Chili from Well Plated is a hearty and healthy turkey chili with black beans and sweet potatoes. It’s perfect for a cold winter’s night. Instant Pot Spinach Artichoke Dip from Southern Kitchen combines spinach, artichokes, onion, garlic, cream cheese, and chicken broth. Cook for five minutes in the Instant Pot, stir in cheese and hot sauce and serve to your hungry guests. They will thank you! Easy Pressure Cooker Meatballs in Tomato Sauce from Hip Pressure Cooking would be great for dinner or an easy game day food that everyone will love! Easy Instant Pot Sesame Chicken Wings from Bake Me Some Sugar start out in the Instant Pot for 4-5 minutes to lock in the flavor and tenderize the wings to perfection. Then pop the wings under the broiler for 2 minutes and you’ve got chicken wings with an Asian twist. Serve to your guests and get ready for the complements! Honey BBQ Instant Pot Cocktail Meatballs from Wine and Glue are super easy if you use frozen meatballs but are even better if you make from-scratch meatballs. Lisa has included a from-scratch meatball recipe but gives cooking instructions for both frozen and from-scratch meatballs. Instant Pot Chili from Simply Happy Foodie is a rich, thick chili made with black, red kidney, and garbanzo beans. Doesn’t that sound like a great combination? Instant Pot Spinach Dip from Living Locurto is a great Instant Pot recipe when you need a simple and delicious appetizer. Serve with Baguette cubes, crackers, or tortilla chips. Easy Instant Pot Teriyaki Wings from Paint the Kitchen Red are finger-lickin-good and perfect for a game-day party! Amy’s Amazing White Chicken Chili from Kalyn’s Kitchen is a perfect game day food but is also perfect any time you want a delicious warm bowl of chili! Kalyn has included instructions for both the Instant Pot or slow cooker so you can choose the method of cooking you prefer. Umami Instant Pot Meatballs from Pressure Cook Recipes are bursting with smoky flavors and have a tender, juicy texture. Plus if you end up cooking more than you can eat for dinner these meatballs freeze well and can be pulled out for another meal. Instant Pot Hard “Boiled” Eggs +Lazy Devils from Nom Nom Paleo are a little bit of a diversion from traditional deviled eggs. Michelle first hard “boils” (which is really steaming) the eggs in the Instant Pot. Then to make Lazy Devils (as Michelle calls them) simply cut the hard cooked eggs in half, slather on your favorite spread and adorn with your favorite toppings. Instant Pot Baby Back Ribs from Simply Happy Foodie brings smoky, tender, meaty Baby Back Ribs to the table in about an hour with the help of the Instant Pot. Instant Pot Low-Carb All Beef Ancho and Anaheim Chili from Kalyn’s Kitchen is a delicious option for a chili that is low-carb. Instant Pot BBQ Chicken Sliders from It’s Yummi is an easy Instant Pot recipe that cooks in just 15 minutes. Add a slider bun and top with coleslaw for amazing game day sandwiches. Instant Pot Chicken Wings from A Mindful Mom are ready in less than 30 minutes, full of flavor, and extra tender with the help of the Instant Pot. Instant Pot Sloppy Joes from She Saved combines ground beef, onion, red pepper, a few spices, and a splash of hot sauce to create fast and easy Sloppy Joes. Keri Lyn says these taste so much better than the canned version of Sloppy Joes. And last, your guests will love these Pressure Cooker Balsamic Meatballs from Pressure Cooking Today. 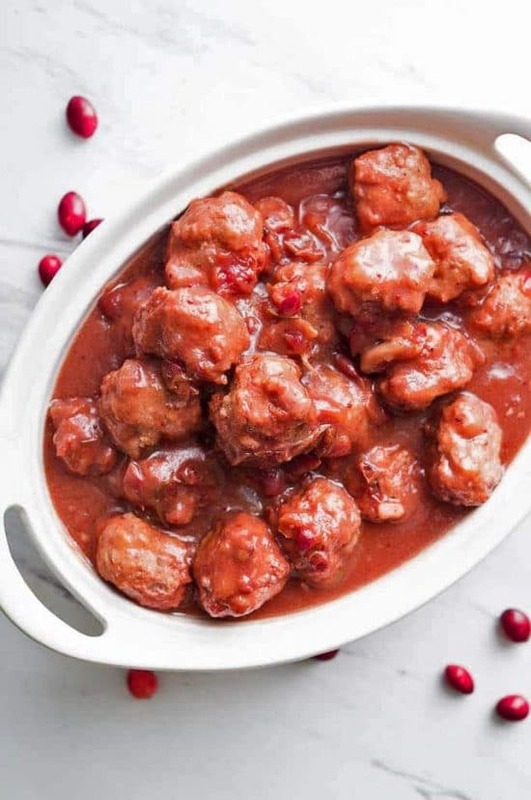 Cranberry, rosemary, and balsamic vinegar create a meatball that explodes with flavor in every savory bite. And with the help of the Instant Pot the cooking time for these Balsamic Meatballs is just five minutes. What foods do you make in the Instant Pot for Super Bowl Sunday? Let us know about it in the comments!